PC-SZ100-RGB RGB LED strip controller 1 remoter to 10 controllers is a capable of multiple zones unified controlling products. The system consists of two parts, the RF remote control and receiver components, to achieve integrated control of multiple areas within the effective distance range, to meet the growing demands of LED lighting control from the market, like RGB LED strips, LED modules, LED string lights and other RGB constant voltage type LED lamps. 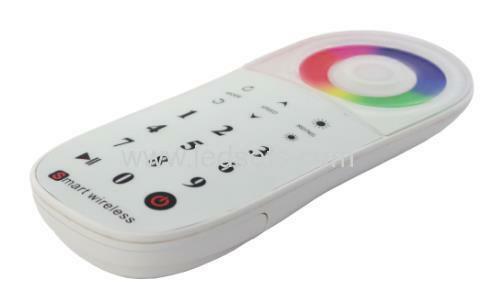 Adopted RF touch 18-key remote control, to achieve independent control of up to 10 areas, including switching, pause, adjust mode, and speed adjustment and brightness adjustment. 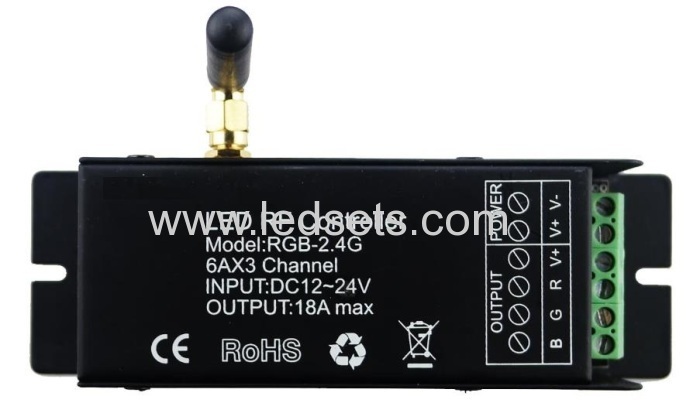 The receiver section compatible with the RGB signal amplifier for power expansion, to achieve more control of LED lights, in theory, numerous RGB amplifiers can be connected. 1. Used for constant voltage LED lamps, working voltage DC12-24V. 2. 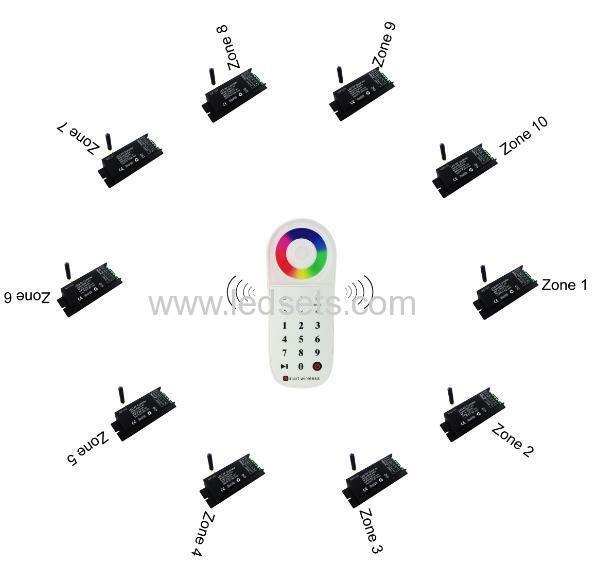 Multiple-zone unified control, achieve independent zone control up to 10 zones. 3. 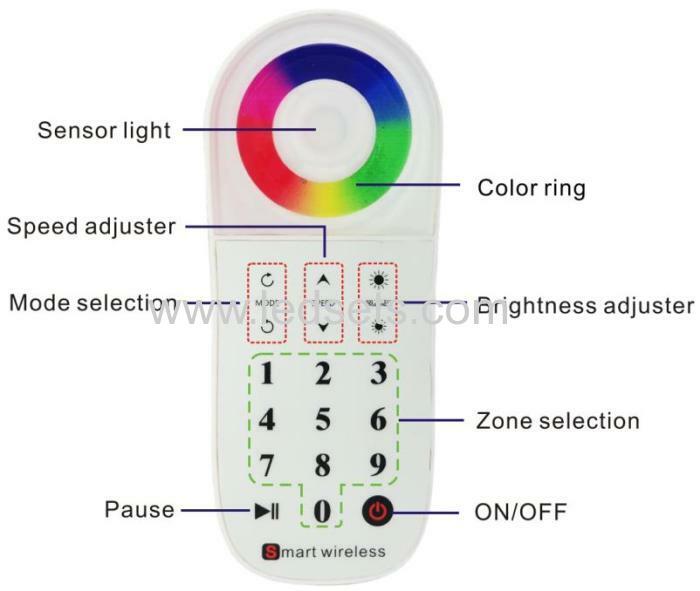 User-friendly designing with Full-color touch wheel for color selection and clear function key area. 4. Adopt RF remote control technology, as RF signal sender, RF frequency: 2.4GHz. 5. Sleep-wakeup design, for energy conservation. 6. Transmission Distance:up to 30m,no need line-of-sight. 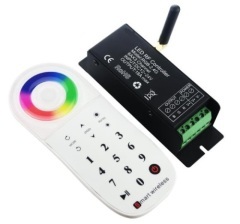 Press and hold the "Pause" key and powering on the receiver(Or Press "Pause" key within 2 seconds after powering on the receiver), the LEDs loading will output 50% brightness white. (Tip: if the output does not output 50% brightness, indicating that the code learning is not successful, need to repeat the step 1). Press the "Number" key 3 times (each time should be finished within 3 seconds after the last time), the LEDs will change as: 25% brightness white >>>10% brightness white>>>back to the mode before power off. It indicates the successful code learning. If not, repeat from step 1.